Today is the end of Gifted Awareness Week, and there is a new post on the WAGC blog. Tomorrow (when it’s still today in America) we’ll link in the last of the international blogs. 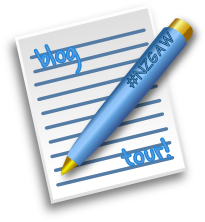 There may be a few follow-up posts from would-be-bloggers for whom life got in the way this week, or from people reflecting on #NZGAW 2011, but the blog tour itself is drawing to a close. So what is the next big thing? The 9th of August is the first ever World Gifted and Talented Awareness Day. Naturally, there’s a project in cyberspace as we lead up to this momentous occasion. And you can be a part of it. Because I am building on someone else’s idea, I’ll start by acknowledging them. The Purpose Education movement have an inspirational photoquotes project. This is where people who enjoy tinkering with pictures and words take a CC licensed image, or an original image of their own that they are happy to CC license, add text (and the author’s name) that expresses their beliefs about quality education, and share the product as a resource for their group and the world to use. We began our own Gifted Education Photoquotes Project a couple of weeks ago, with a target of ten photoquotes by Gifted Awareness Week. As you’ll see, we met the target! 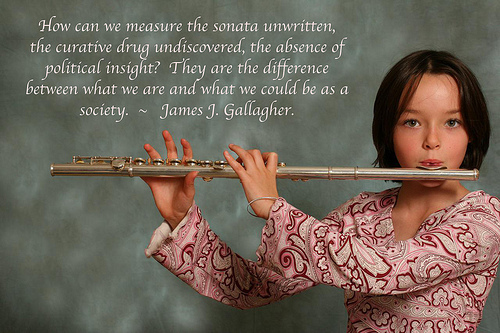 Can we have 100 photoquotes by World Gifted & Talented Awareness Day? I’d love to see that! Where can you source appropriate quotations? Provided you acknowledge the author, you can quote from books, journals, theses, web pages and blog posts on gifted education and advocacy. If you’ve got something terrific and brief to say, you can use your own words (but still name the author, even if it’s you – enquiring minds want to know!) Carolyn of Hoagie’s has kindly given me the link to her gifted education quotes page, and you may find other quotations pages inspiring as well. It’s amazing what has been said by many people, in many fields, over many centuries that seems oh-so-very-relevant to gifted education today. Please add photoquotes in a range of languages, if that is one of your skills. Adding the text to the photoquote description (or a comment) as well will mean that people can use Google Translate or similar tools more easily to find out what you have written. All you need is a Flickr account, an image, a quote, any software that will let you add words to pictures, and an understanding of CC licensing. Please contribute. It’s lots of fun – and – it’s the next big thing! CC licensing has allowed me to add inspiring words to a gorgeous photo, provided by a stranger. The photoquote inherits any CC license restrictions on the image you used. The photo of the girl with the flute is by Flickr member SimonWhitaker and had attribution and non-commercial licenses. I added a share-alike license to my altered version. Here’s another resource on CC licensing, in cartoon strip form. Scroll down for the English version. It’s very helpful. This entry was posted in gifted, online resources, Uncategorized and tagged #nzgaw, Gifted Awareness Week, photoquotes, world gifted and talented awareness day. Bookmark the permalink.